American painter Jackson Pollock created some of the best art for hanging in penthouses and corporate headquarters. His signature style of drips, slashes and splashes created a storm of controversy, especially when pieces were purchased with public money. 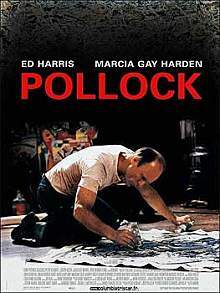 This biopic was spear-headed by the excellent actor Ed Harris, who had been told he looked like Pollack. Sadly, this isn't enough to build a film on. Pollack lived hard, fast and rough. He experienced fame in his lifetime, and he became a symbol of the artist as a lone voice. For all this reviewer's admiration of Harris and his work, this film was ordinary. Interesting, but ordinary. Strictly for the fans of biopics, Pollock, and Harris.